The Black Book of Communism alleges that communism killed 94 million people during the 20th century. This number is accumulated from more than 10 different nations and various movements around the world. It includes two of some of the most populated nations on Earth — China and the Soviet Union. Despite being cited often, the Black Book of Communism has repeatedly been criticized for it’s reckless, careless, and highly questionable methodology. Some of the major criticisms against the Black Book of Communism includes the fact that it counts the following as “victims of communism”: some nazis and their collaborators who were killed by the Soviet Union during World War II, people who died in the 1921 Russian famine (which was caused by drought, the whites stealing food, war, etc), other hunger-related deaths caused by the nazi war against the Soviet Union, and many other incidents that were dishonestly attributed. The book contains deaths dishonestly attributed to communism by completely ignoring external factors such as sanctions, foreign military intervention, etc. It also includes inaccuracies of historical events such as when Werth credits the Austro-Hungarian army, not the German army, for the occupation of Poland in 1915, making the ridiculous claim that the bolsheviks only had 2,000 members in October 1917 when they actually had around 200,000 members, or claiming that the infamous U.S.-backed dictator Batista “fiercely opposed” the U.S., and in some instances, pulls numbers straight out of thin air. 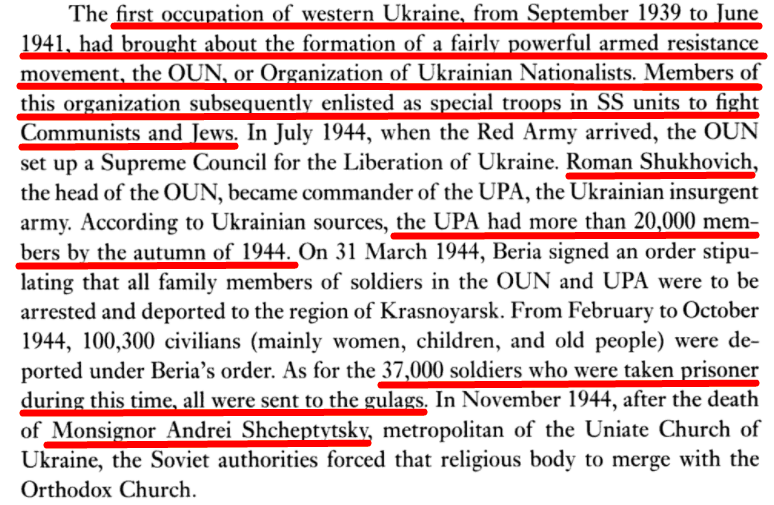 A passage from the “Black Book of Communism” where it portrays the OUN/UPA nazi collaborators as heroic victims of communism who fought against the ‘commies and jews’ . They are responsible for pogroms in Ukraine where they murdered tens of thousands of Jewish, Polish, & other ethnic minorities alongside of the German nazis such as in Babi Yar (1941) where they later set up the Syrets nazi concentration camp in 1942. 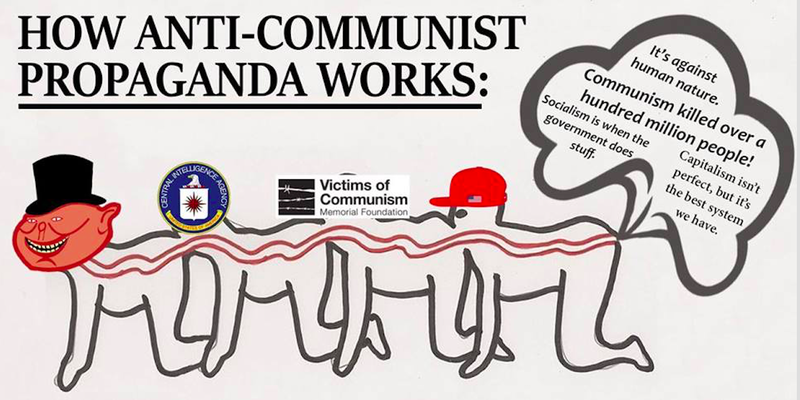 The claim that communism killed 94 million people during the 20th century, for all intents and purposes, is an outright lie that hinges on counting millions of deaths that were not caused by communism and by having sympathies for nazis and their genocidal collaborators during WWII, as if they were victims of anything but justice. But that is a whole discussion for another time — even with the Black Book of Communism’s fake death toll, many people have taken it upon themselves to stretch that lie even more, attempting to place the death toll at 100 million. The false and inflated number of 100 million people being killed by communism over 100 years will be the number I will use just because it is the most common myth perpetuated. If the allegation against communism is that it killed 100 million people, how many people did naziism kill? The Holocaust death toll is estimated to be between 15 million to 20 million people. That is at least 1.25 million people killed each year. Compared to communism’s alleged one million deaths among ten different nations and from various movements. If naziism kept that pace of 1.25 million people killed each year, it would reach 125 million deaths in a century— compared to communism’s alleged 100 million. Comparing the alleged deaths of 100 years of communism to the death toll from 12 years of naziism is intellectually dishonest, you are comparing apples to oranges. When you realize that you are comparing 15 million deaths in 12 years versus 100 million deaths in 100 years, the claim that “communism killed more people than naziism” starts to become more visible as the nazi propaganda that it is. However naziism is responsible for more deaths than just from the Holocaust. Naziism is why World War II even happened — had naziism not been created then Nazi Germany wouldn’t have caused the world war, and World War II (as we know it) would not have existed. It is possible in a hypothetical universe that a war would have still occurred given the material conditions that the nazis exploited to rise to power. But at the same time it is also possible that other people would have risen to power and not caused a war. But we live in this universe and in this universe WWII was officially caused by Nazi Germany after rising to power by exploiting the dismal material conditions in the failed capitalist Weimar Republic. The number of civilians killed during WWII is estimated to be about 50 million people to 55 million people (almost all being allied civilians, largely Soviet civilians), about half being from famine and war-related diseases. Military deaths range from 21 million people to 25 million people — in total that is about 71 million people to 80 million people killed because of naziism’s war on humanity through WWII. Using both of the most conservative estimates, 71 million from WWII and 15 million from the Holocaust, that’s about 86 million people killed by naziism. In 12 years. Naziism was only getting started with it’s killing though. The nazis had a plan called “Generalplan Ost”, a plan for genocide of Slavs and colonization of Eastern Europe. The population of the Soviet Union was over 160,000,000 people before the war and had a net growth of almost over a million people each non-wartime year. In 1946, the population of the Soviet Union was 170,548,000, after losing over 20,000,000 people during World War II. The nazi plan, had the Soviets and their allies lost, would have resulted in the deaths of about 200,000,000 people in the Soviet Union. What about the deaths caused by neo-nazis since World War II? Since 2014, thousands of civilians have been killed by the neo-nazi militias of the fascist Ukrainian government such as Azov in Donbass with grad rockets, by cutting off water supplies, shelling the homes of civilians, and more. An alt-right nazi terrorist in Norway (2011) killed 77 people and injured over 300. The number of deaths by nazi terrorist attacks, neo-nazi movements, and regimes inspired by Nazi Germany adds more and more deaths to the nazi death toll. Nazi Germany was born in 1933 and died in 1945. In 12 years of it’s ugly existence, it led to the deaths of over 86 million people between the Holocaust and causing World War II. Meanwhile the allegation against communism over 100 years in 10 different nations (two of which were some of the most populated nations on Earth), and from various communist movements around the world is 100 million people killed. And as for capitalism, 100 million Indigenous people in the Americas were killed during the European colonization for the propagation of American capitalism, as well as millions of African people that were enslaved as property to be profited off of by capitalists in the West. How many people have been killed by capitalist sanctions? How many people have been killed in capitalist wars? How many people have been killed by capitalist dictators like Pincohet? How many people have died and will we let die for profiteering? Every time you preach this lie, you’re aiding the rise of neo-naziism & fascism. Put the intellectually dishonest claim that “communism killed more people than naziism” to sleep — you’re lying to yourself & everybody around you.